A seething revolt across much of Syria is being met with ferocious repression by the Ba’athist government’s security forces. But so far, the two cities where close to half of Syria’s population lives - Damascus and Aleppo - are relatively calm. In this evolving situation, what are the prospects for Syria’s regime and people? Vicken Cheterian reports and reflects. A visit to Damascus, at a time when so much of the rest of Syria is burning, offers a striking contrast to the images of the country presented in international broadcasting media. The Syrian capital appears calm, traffic is as busy as ever, the shops are open, and people follow their daily preoccupations. Everyday life also seems to proceed as normal in the city’s far-flung suburbs such as Harasta; while late at night in the newly developed area of Jermana where many Iraqi “brothers” live (in Syria they are not called “refugees”), the shops are open, fruit-vendors call to their clients on street-corners, and traffic is dense. The visitor has to look carefully for signs of the unusual. The only tourists at the popular Hamidiyeh markets and the Umayyad mosque, for example, are Iranian pilgrims. But the most amazing thing is that everyone talks about politics without fear of the notorious mukhabarat (secret police). There have been protests here too, especially after Friday prayers. And one foreign resident of the city says that “recently we see fewer posters of Bashar [al-Assad] in shop windows”. If these are indicators of tension and change, Damascus - the capital of a country in rebellion - has remained largely tranquil. Yet in the surrounding countryside (reef dimashq) are towns and villages (Duma, Daraya, Madimya, Zabadani, among many others) where for weeks now the population has been in revolt against the security agencies, and where demonstrations, clashes and casualties have become routine. Indeed, the entire Syrian countryside and many of its towns - from Deraa in the south (the initial spark of conflagration in mid-March 2011) to Tal Kalakh on the border with Lebanon; Latakia and Banyas on the Mediterranean coast; Homs, Ar-Rastan, Hama in the west; Jisr al-Shaghour in the north; Hasakeh and Qameshli in the Kurdish northeast; and Deir ez-Zor in the east - are a theatre of confrontations, where fire and sword is drawing a new political reality. In this context, Aleppo and Damascus, the two major urban centres where close to half Syria’s population live, are (“to a degree of embarrassment”, according to the same non-Syrian observer) so far the exception to the pattern; though it is notable that the first protester was killed in Aleppo on 17 June, another sign of the revolt spreading. Jabal Qasyoon is a mountain overlooking Damascus, and a tourist trap. On a fine afternoon I take a taxi to the summit, where I sip oriental coffee and enjoy the peaceful view of the ancient city below. The weather is pleasant so I decide to walk back down to the city centre. As soon as I turn towards the road and start going downhill, a soldier emerges from the woods and orders me not to walk on this, left side of the road. Without question I obey, and cross to the opposite side, which in any case offers a better view from the ahla talle hillside to the al-Muhajerjirin neighbourhood to the city’s northwest. The hill is full of heavily armed soldiers, well hidden within the bushes and trees. A Syrian friend later tells me that such a heavy military presence on the hill is new. Soon, the alert visitor will also notice similar quiet but definite changes: special military forces next to the usual police guards outside Damascus’s government ministries, carrying Kalashnikovs and wearing protective jackets, armed security agents in civilian clothes in various corners of the city. In the Mezze district to the west of the city centre where high-rise apartments house army officers and their families, a new concrete wall surrounds the neighbourhood, guarded by soldiers. * a large part of the urban population no longer fears the regime’s repression, yet fears what might come with its downfall. “We do not want another Iraq or another Lebanon here”, says one trader. Many in Damascus - conscious that Syria, unlike Tunisia and Egypt, belongs to the same neighbourhood as Iraq and Lebanon - worry that the easing of tough security will lead to confessional conflict. Syria is going through an uprising of socially marginalised regions, suffering from the absence of institutions and services, where the most obvious state presence has been the security agencies. The context of this revolt is the weakness as well as the strength of the state. The Syrian regime portrays its major assets as opposition to great-power politics and support for anti-Israeli resistance. Its true chief resource is the fact that parts of the population still see it as a guarantee of stability and security. But this resource is fragile, and eroding under the pressure of the current violent confrontation. The revolt that started in Deraa is, despite ferocious repression using live bullets, spreading rather than dying down. Several towns and cities remain under siege, with telecommunications shut down, highways blocked, and the country isolated from the outside world. A key question is how long such a situation can persist before the merchant class sees the regime as part of the problem rather than the solution; and whether, to avert this outcome, the Syrian authorities can learn how to use their most valuable (if now damaged) resource - the fact that they have come to represent stability and a defence against chaos? “I do not care about who rules, or the type of regime” a Syrian friend who supports the status quo told me. “What I care about is that when my children go to school or university, I do not worry about their safety.” But today, he is worried about his family’s immediate safety. Another analyst adds: “Neither repression nor the promise of reforms can calm the situation. Dialogue is declared, but dialogue with whom? We do not see it happening. How can it give any results?” When asked what the authorities can offer to the population to defuse the situation, the response is: “The only promise the president can give is to be the leader of a political transition”. But as Bashar’s latest speech confirms, the regime is managing the situation day by day - mixing repression here, the promise of dialogue there. This is unsustainable over the long term. The security forces are over-stretched, and massive operations need resources. The state treasury cannot forever ensure such funding, especially as it has made costly economic concessions in other areas to appease popular anger: increased salaries and decreases in the price of diesel, even as Syria’s economy is in trouble and state revenues in free-fall. The oil sector that covered the foreign-trade deficit in the 1980s-1990s is in decline; in 2008, Syria started importing oil. The traditional industries such as textiles are in crisis because of foreign competition. Syria’s rapprochement with Turkey seems to have hurt domestic production as markets are flooded with cheaper Turkish products, and now also Chinese products. Agriculture, which employs 30% of the workforce, is suffering a fifth year of drought. In 2010, the United Nations’s World Food Programme appealed for humanitarian emergency aid to some 300,000 people in the northeastern jazeera region (Hasake, Raqqa, Deir ez-Zor); hundreds of thousands have left their land in those regions and moved to such places as the Damascus countryside, Homs, and Deraa - thus increasing the pressure on jobs and housing there. After decades of failed policies and the marginalisation of provincial economies, short-term subsidies appear a desperate measure. The only feasible way out of the economic crisis has been to rely on tourism, and on foreign investments to modernise industry and services. Those two sectors are hit by the current security situation, while international sanctions will further reduce the availability of hard currency. The central bank is demanding that private banks raise their deposit from $30 million to $300 million, an act of desperation which could lead to further capital flight. The Syrian media projects a single, official, one-sided narrative of what is happening in the country. This alleges a foreign conspiracy aimed at weakening Syria’s mumanea (rejectionist) stance against western dictates in regional affairs; rejects compromise on the Palestinian cause; and supports Hizbollah’s anti-Israeli resistance, and alliance with Iran. The conspiracy is fuelled by foreign money and promoted by a media campaign run by satellite Arab televisions such as al-Jazeera. Syrian television shows footage of security officers hospitalised after receiving gunshot wounds from “armed bands”, and funerals of officers killed during confrontations. I watched a programme on Dunya television, a talk-show featuring Jamal Mahmoud, professor of political science at Damascus University. Nothing in the professor’s exposition or analysis differed from those in the official media. But two elements in the interview were noteworthy. The professor expected “a decisive action from President Bashar Assad” to put an end to the rebellion - though he was vague about the details, and the journalist not insistent. He also said that: “To exit the crisis, all forces should insist on national unity”. I was curious to know to whom this appeal was addressed (the various political parties, regions, social classes?) This time the professor followed up with more precision: he called on all the confessional groups to unite! In other words, after four decades of Ba’athist, self-declared “secular” rule, the political actors of the country are confessional groups - just as in the Ottoman millet system. Another dynamic is that the Syrian rebellion is conditioned by the Friday prayers and the demonstrations that follow. These demonstrations are largely peaceful; no insurgency exists to push its followers into the line of fire of armed security forces. The brutal repression leads to funeral processions on Saturday and Sunday, which turn into new demonstrations of defiance. More than anything, the violent conduct of the regime is conditioning the nature of the rebellion: leaderless, lacking coordination, and itself increasingly combative. The demonstrations around the country are largely peaceful, but there seem (unsurprising in the circumstances) to be numerous incidents of armed resistance when the security forces encircle an entire village or city, and behave as if they in major counterinsurgency mode. They begin by closing all communications (including internet, telephone, and electricity as well as water); then open fire from a distance on people in the streets; and end by entering the settlement to carry out house-to-house search and mass arrests. A degree of armed opposition using rudimentary weapons is inevitable in some cases. The overall result, according to the exiled Syrian Observatory for Human Rights as of mid-June 2011, is that over 1,139 civilians and 212 military have been killed since the outbreak of the revolt. The political opposition abroad seems to have little influence on the rebellion inside the country. The same can be said of the well-known dissidents of the Damascus declaration (2005), who were imprisoned and harassed by the regime. The Syrian revolt is leaderless. This very fact poses a dilemma to the regime, for there are no figureheads to arrest nor to invite to dialogue. The question of whether and how far what is happening in Syria can be understood as a confessional conflict is clearly vital. At present at least the answer is clearly no, though Jamal Mahmoud’s words can be taken as a coded expression of the possibility. The situation is complicated. The authorities are imposing mass retribution on entire regions that express disobedience, regardless of their confessional belonging. This in turn reinforces local and broader dynamics of rebellion, in some of which (as in the more generic social realities) confessional thinking and identification may be very much present. Everywhere in Damascus, it is possible to hear that the fall of the regime would create a Christian exodus resembling the Iraqi one, or that the regime is dominated by Alawis. A dissident-writer in Damascus said: “Syria was ruled for forty years in the name of Alawis, but if you go to their villages you see in what poverty they are living in.” He also said that people hoped that the national army would take a different position to the security agencies, and refuse to shoot at civilians - but that so far this distinction has not been evident. The collapse of the Soviet Union showed that the conditions in which a regime falls will to a great extent determine what kind of political system will take its place: Russia experienced near state collapse with catastrophic consequences, while Poland’s political transition was organised through the “roundtable”. 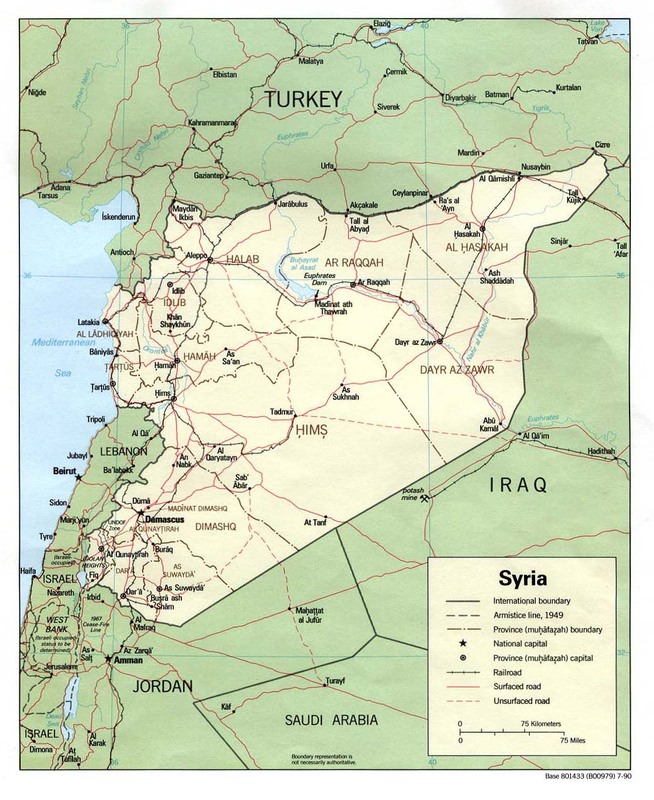 Syria changed irrevocably on 15 March 2011 - but its future trajectory will depend on the way the transition of power takes place. The Ba’athist regime that has ruled for decades has emptied Syria’s other, notional political parties of their content: even the Ba’ath is not a real political party in the absence of any competition, and the so-called “National Progressive Front” is mute in face of the current crisis. The last time the trade unions organised a demonstration for workers’ rights was before the Ba’ath took power. That was in 1963. Almost fifty years on, the security-regime is feeling the strain of popular pressure in conditions where meaningful national institutions are lacking; the army seems unable to play an independent role; and forceful repression prevents the Syrian people from creating a united, Tahrir-Square-type movement. The central question remains whether the Syrian rebellion will have enough time to replace the state-security apparatus, before a more destructive implosion. In these conditions, the future of Syrian politics is uncertain.